Continuous emission monitoring systems, known as CEMs, are used by plants and facilities to assure compliance with the EPA’s requirement to limit the amount of certain gasses (such as CO2) into the air. A CEM samples, measures, collects data, records and reports the gas emissions information. 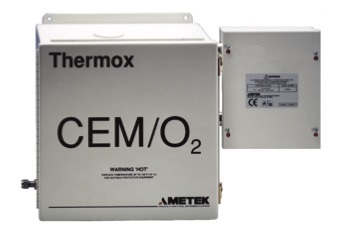 CEM systems can also measure and report gas flow, gas opacity and moisture content. CEMs are typically used to monitor flue gas emissions (the gas exiting to the atmosphere via a flue from an furnace, oven, or boiler). CEM system are made up of a sampling probe, a filter, a sampling line, a means to condition the gas being sampled, a gas used for calibration, and a group of gas analyzers geared toward the gases being monitored. The most common gases measured are: carbon dioxide, carbon monoxide, airborne particulate, sulfur dioxide, volatile organics, mercury, nitrogen oxides, hydrogen chloride, and oxygen. Continuous emission monitoring systems operate by extracting a small diluted gas sample into the CEM via a sampling probe. The sample is diluted with air because of the hot, wet, and contaminant carrying nature of the stack gas. Once the sample gas is taken, the concentration of its components are calculated through a variety of technologies such as infrared and ultraviolet adsorption, chemiluminescence, fluorescence and beta ray absorption. After analysis, the sample gas exits the analyzer and is usually vented outdoors. Another method of extracting a sample gas is called "hot dry" extraction or "direct CEMs". In this situation, the sample gas is not diluted with air, but instead the pure sample is carried through a heated line at high temperatures, filtered to remove contaminants, and dried to remove moisture. This method is preferred when O2 measurement is required because there is no additional oxygen being introduced via the air dilution as described in the above method. The EPA requires a data acquisition and handling system to collect and report the data, so the CEM must operate continually and provide data on an hourly basis.